Why Blanch? Make Your Veggies POP with Color! Blanching 101. 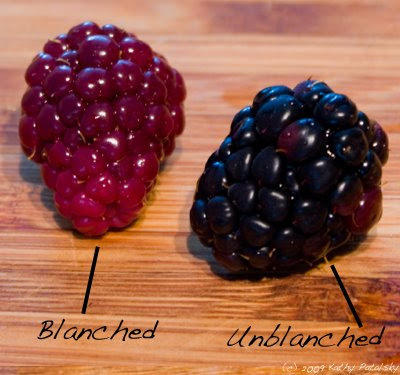 The word 'blanch' reminds me of that sultry southerner on the TV show The Golden Girls. 'Thank you for being a friend...' (Sorry, bad 80's flashback.) Blanching (not Blanche) is actually a very cool, literally, cooking technique that helps keep your non-raw veggies happy and healthy. Blanched veggies retain more nutrients, absorb less oil in a saute and have a bright healthy color. The technique is super simple. After blanching, you can saute, season or store your veggies. Blanching allows you to cook your veggies until they are tender, but not overcooked. 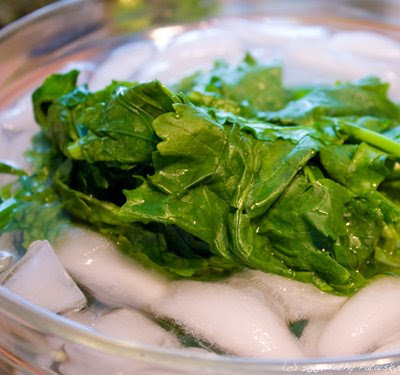 A simple ice bath "shocks" you veggies and halts the cooking process, 'freezing' the veggies at that perfectly tender stage. *Blanching seals in the color, flavor and nutrients of the veggies. 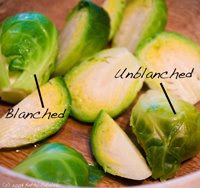 *Blanching is great for loosening the fibers and flesh of veggies. Shortens cooking time in a saute or stir-fry. *Blanching loosens the skins of veggies like tomatoes-for easy peeling. *Blanching releases a bit of water from the veggies, so more flavor in the finished product. *If sauteing in oil later, the blanched veggies will require less cook time and absorb less oil. Healthier end result! 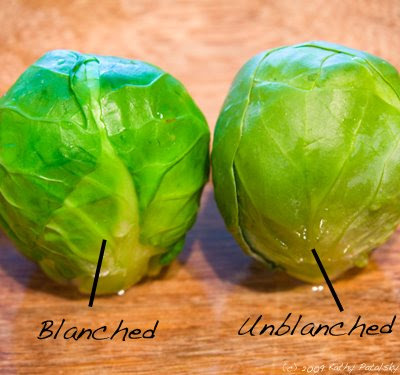 The photo below shows a brussel sprout that has been blanched (left), and one that is still raw (right). 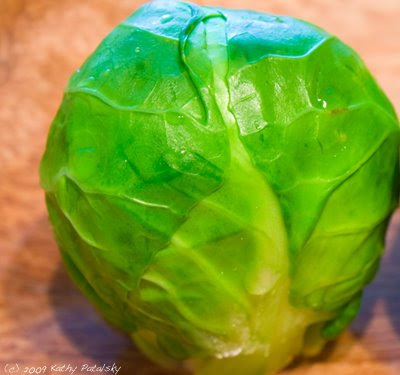 As you can see, the blanching process brings out an intense green color in the sprout. Blanched veggies can have a vibrancy that raw or overcooked veggies lack. You can blanch just about anything. But typical blanched veggies include brussel sprouts, asparagus, stir-fry veggies, mini onions, broccoli, green beans, carrots, kale, broccoli rabe, cabbage...and the list goes on. 1.Get your tools out: large bowl of ice and water (ice bath), tongs or slotted spoon, pot of boiling salted water, your veggies. Salt the water, bring to a boil. Clean/chip/prep veggies to be blanched. Submerge veggies in boiling water. Allow to boil until tender-just about done, but do not overcook or it will defeat the whole purpose of blanching. The amount of time you boil the veggies for is the KEY. It may take some practice until you know how long each different veggie needs to be cooked for. Using tongs or a slotted spoon, transfer veggies directly from pot to ice bath. Remove from ice bath after a few seconds. The veggies will cool off- stop cooking- quickly. You may season and plate your veggies or season them and add them to a medium heat pan for a quick light saute. A saute will help brown up the edges and give the blanched veggies a savory flavor. Plus-it will re-heat the veggies since they have been cooled off by the ice bath! BONUS: Another reason people blanch veggies is to freeze them for storage properly. Blanching stops the 'ripening' process and therefore assures that the veggies will not over ripen or 'go bad'- even when frozen.